Here’s another use case scenario for HoneyPoint Security Server. 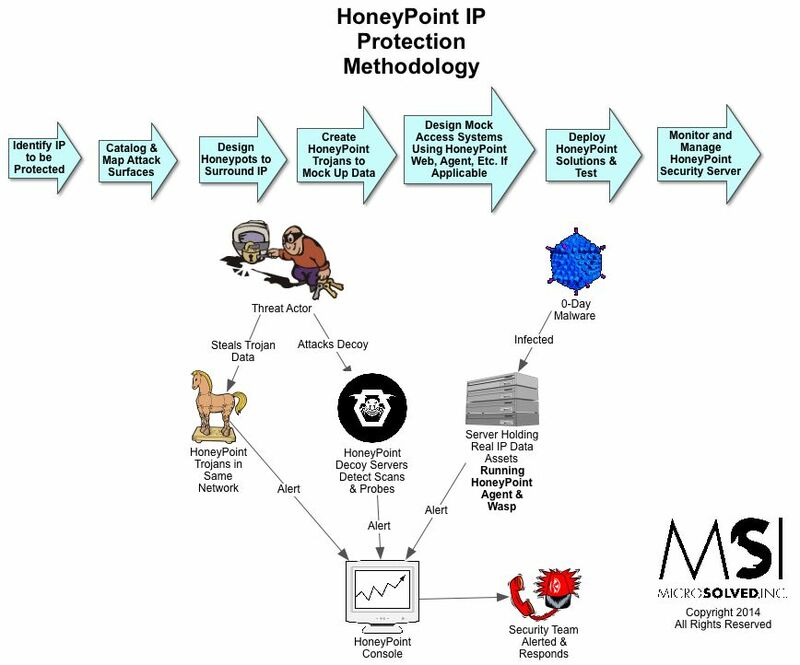 This time, we show the methodology we use to scope a HoneyPoint implementation around protecting a specific set of Intellectual Property (IP). If you would like an in-depth discussion of our process or our capability, please feel free to reach out to us and schedule a call with our team. No commitment and no hard sale, guaranteed. If the graphic below is blurry on your device, you can download a PDF version here. 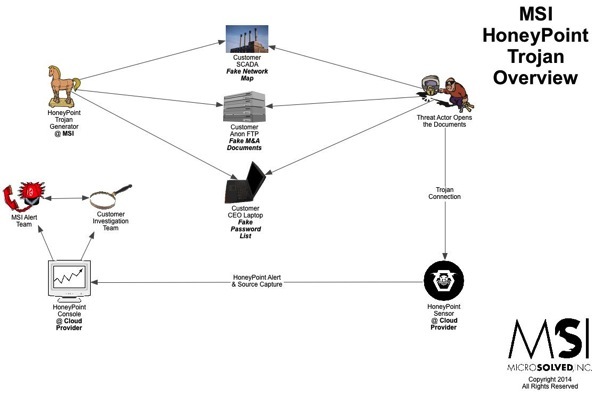 Here’s another quick overview graphic of how HoneyPoint Trojans work. We have been using these techniques since around 2008 and they are very powerful. We have incorporated them into phishing exercises, piracy studies, incident response, intrusion detection, intelligence gathering, marketing analysis and even privacy research. To hear more about HoneyPoint Trojans, give us a call. We have been getting a LOT of questions lately about how HoneyPoint Security Server (HPSS) fits into a Point of Sale (POS) network. To make it pretty easy and as a high level overview, below is a use case diagram we use to discuss the solution. If you would like a walkthrough of our technology, or to discuss how it might fit into your specific use cases, please let us know. As always, thanks for reading and for partnering with MicroSolved, Inc.
PS – If the graphic below is difficult to read on your device, you can grab a PDF version here. Recently, there have been several questions about potential deployment scenarios for HoneyPoint Security Server in and around ICS and SCADA organizations. Here is a quick, high level view of what a sample deployment might look like in a utility or other ICS environment. Note that the sample environment has fully embraced enclaveing. The network is fully segmented based on function. In organizations where segmentation or the use of enclaves has not been established, HPSS can still be used and would be deployed in much the same manner. Please let us know if you have any questions about this diagram or about deploying HPSS in your environment. We would be happy to set up a free consultation with you to discuss how the tool could aid in your detection program and give you increased visibility throughout your enterprise. PS – If the graphic is difficult to read, right click on it and select view in new tab. The theme for the site is having trouble with this particular graphic. Many folks have been asking us for an “At a Glance” kind of graphic about HPSS. Here is a first attempt. Please let us know what you think via the comments or on Twitter (@microsolved). Thanks for reading! What is this HoneyPoint Thing Anyway? Launched in 2006, initially as a distributed honey pot product, HoneyPoint Security Server (HPSS) has grown well beyond the initial concept. Today HPSS is a platform of components woven into a tightly integrated, fully capable, extremely flexible threat detection product. Organizations around the world are using it as a means of early detection of internal and external attackers, malware outbreaks and signs of users poking around where they shouldn’t be. Mature organizations have leveraged the product as a means of deterring attacks through automated black holing of scanning hosts on their perimeter, embedded detective controls inside their web applications to cut off users violating their terms of service and gather real world threat metrics to feed back into their mature risk management initiatives. In the world of ICS/SCADA, HoneyPoint has found a quickly growing set of fans. HPSS can be deployed in a completely passive way that has no chance of interfering with critical operations, yet still brings incredible detection capability and vision into even the most sensitive of networks. 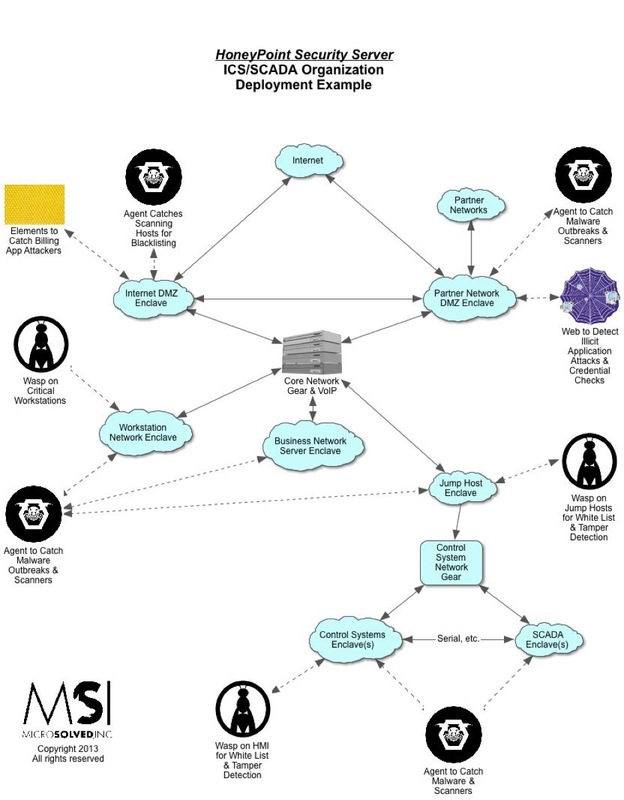 ICS/SCADA environments have traditionally embraced the honeypot ideal, coining the term “canary” for these tools, but never before have they had such an easy to use, distributable, centrally monitored honeypot capability like HoneyPoint brings to the table. HPSS Console – This is the central “brain” of the product. Designed as an easy to use GUI application, it receives the alerts detected by the sensor components and presents them to the user for analysis. It includes the “plugin” capability which allows for additional reporting and security automation based on the event data detected. The Console provides for “point and click” easy integration with SEIM products for clients who have deeper back-end data aggregation systems in place. 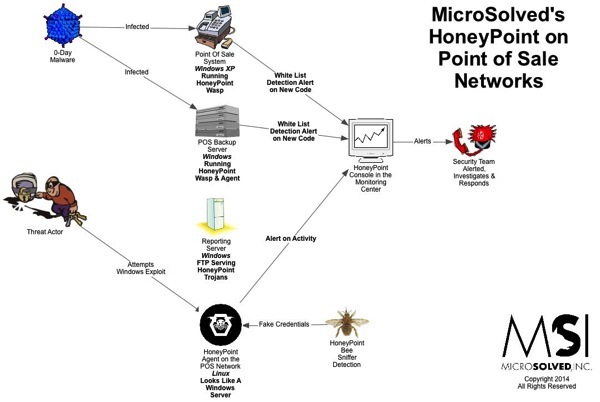 HoneyPoint Agent – This is the original HoneyPoint detection capability. Agent creates “fake services” on the network that have no real use other than detection. Since the services aren’t real, any interaction with them is “suspicious at best and malicious at worst”. Agent is capable of emulating a great variety of services and is completely user configurable. Agent runs on Windows, Linux and OS X.
Wasp – Wasp is HoneyPoint’s hybrid client for Windows systems. It offers many of the port dilation features of Agent, but layers on top of that a whitelisting detection mechanism, file change detection for key files and some simple heuristics to identify the most common signs of intrusion. Tiny footprint, immense flexibility, self tuning whitelisting and no interference with operations make it an excellent choice for critical infrastructure use. HoneyPoint Web – This is a completely emulated web environment with a mock up of applications that the organization uses. The entire environment is “fake” and studded with detection mechanisms that capture and measure attacker behavior, intent and capability. It might seem to be a new version of a banking application “accidentally” exposed to the Internet, or a replica of an HMI or maybe a login portal for Sharepoint/VPN or some other mechanism. What it really is is a detection mechanism for the good guys. Completely customized, able to detect the difference between a human attacker and most malware, it offers organizations a deeper, sneakier way to detect illicit behavior and measure the attacker attention various attack surfaces receive. HoneyBees – These work with Agent to simulate users authenticating to emulated services with plain text credentials. Organizations use this combination of tools to detect sniffing attacks and other attempts to harvest credentials off the wire or from network monitoring systems. HoneyPoint Trojans – Trojans are “fake” documents, applications or archives that appear to be real, but are actually detection mechanisms. For example, they might appear to be a PDF of some acquisition plans, while in reality they are armed with code to alert the security team when they have been opened or tampered with. Trojans use many of the same tactics as attackers, but instead of infection as a goal, they provide for detection and alerting. HoneyPoint Handler – The Handler is a mechanism for getting external events into the HoneyPoint data ecosystem. Organizations often use the handler to receive events generated by custom nuance detection scripts. For example, a script might routinely check for new files in a directory or new files that contain the call base64decode(). When the script identifies a new file, the script can send an alert to the Handler, which will create a standard HoneyPoint alert from the script’s data and send it to the Console for easy and standardized security event management. HoneyPoint Decoy Appliances – This is a set of hardened Linux powered devices that serve as an appliance for other components, usually Agent and Web. The appliances are available in three physical form factors (a rack mountable server, a mini-desktop, and a field deployable power substation solid state system) and/or a set of virtual appliances for most common virtualization platforms. HoneyPoint Proxy – Lastly, this component is designed to act as an alerting data aggregator to simplify firewall ACLs that might be deployed between DMZ segments, enclaves or other network segments. The proxy can receive events from HoneyPoints and send them on to the Console without the need to expose the Console to each individual HoneyPoint. This makes managing global and highly distributed deployments significantly easier. To learn more about these components and how they can be leveraged to give your organization new, flexible and deep detection capabilities, give us a call. Our engineers would be glad to discuss the technical capabilities and an account executive would be happy to work with you to create a HoneyPoint deployment that meets your needs AND your budget. 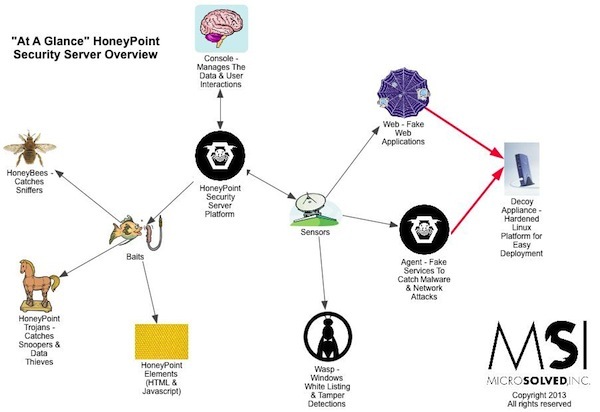 At MicroSolved, we are passionate about information security and HoneyPoint Security Server is just another that way it shows!